We explore some of the research that is emerging about the importance of living things in the landscape that contribute to terroir including the biota layer – the effect of living things. These living things range from the macro including birds, wasps and spiders down to the micro such as tiny single-cell bacteria. We explore the effect they have on the aroma, taste and texture of wine. We then show that the use of pesticides, fungicides and herbicides damages the biota in the landscape and hence reduces the expression of terroir in wines made from sprayed vineyards. The true concept [of terroir] is not easily grasped but includes physical elements of the vineyard habitat – the vine, the subsoil, siting, drainage, and microclimate. His survey of the geology of French regions and vineyards is exemplary and his efforts to explain the differences between adjacent vineyards in Burgundy and Bordeaux, for example, was ground-breaking at the time of publication. His work in describing how soils differ from the top of a slope to the middle and then the lower slopes is important in understanding why some tiny ‘climats’ are held in such reverence in these areas. However, even though the book is over three hundred pages in length only two or three paragraphs are devoted to what lives in the soil! And these paragraphs mainly talk about the acid secretions of bacteria and how this slowly leads to the breakdown of solid rocks into soils. Soils are more various than vines. They form by an infinity of processes from raw materials as contrasting as sea shells and lava. In their physical make-up, chemical reactions, their interactions, in whether they are willing or grudging to release their elements, from water to metals, they encompass wide, sometimes contradicting, differences. If Chablis tastes different from Meursault, Margaux from Pauillac, the first place we must look for the difference is underground. So, both these authors intuitively understood that soils are a vital element in terroir and they both appreciated that the minerals in the soil somehow play a part in making the wine taste different. But the book was published nearly twenty years ago and research into an even more important factor was still in its infancy, namely what ‘lives’ in the soil! The more that is learned about the life that exists within the soil, and within the vineyard itself, the more that is learned about the effect this life has on the wines that are produced from that soil. We have decided to add this new element to our discussions about terroir as you can see in the diagram below. 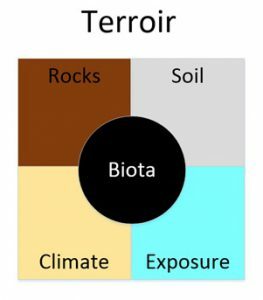 Here we show the four conventional elements of terroir around the outside, namely rocks, soil, climate and exposure. Rocks are the bedrocks from which the soil in the vineyard is derived. The rocks in Chablis, for example, are Kimmeridgean limestone which was formed in the Jurassic period. Chardonnay grapes thrive in the soils derived from limestone whether it be clay or gravel soils. On the other hand, the Carignan grape that is favoured in the Saint Chinian appellation in the ruggedly beautiful area around the village of the same name, has an affinity with the Ordovician schists that are found in the area. In the Beaujolais region the Gamay grape is favoured because it loves the soils formed from decayed granite that is found in the cru areas such as the Grille Midi climat of Fleurie. In Australia, Cabernet Sauvignon wine made from the rich, red “Terra Rossa” soils of Coonawarra attract a premium price therefore consumers obviously think that terroir plays a part in the quality of wine. 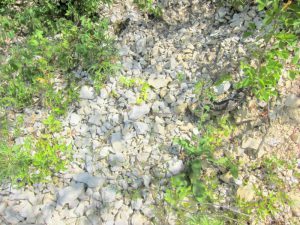 The soil type can vary even though it is derived from the same rocks. Soils on lower slopes tend to have a higher clay content than those higher up the slope, for example. Sometimes the rocks get broken by repeated frosts into large pebbles which dots the surface of the vineyards such as in Chateauneuf-du-Pape. Sometimes the rocks weather away leaving only the very tough ‘silex’ pebbles, the name given to flint in France. Climate has always been recognised for the contribution it makes to the vines and the grapes. The lingering mists of Bordeaux lead to slow ripening of the grapes, whereas the scorching hot sun in Provence and Roussillon leads to faster ripening. 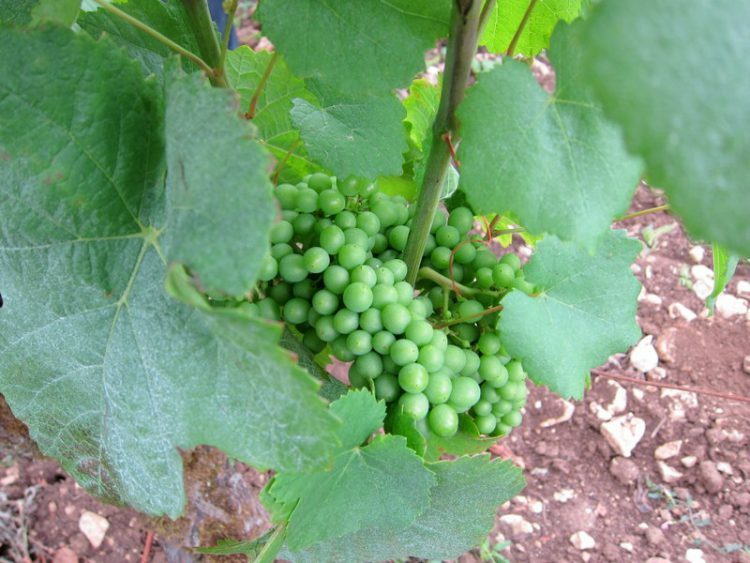 The hail storms that beset areas of Burgundy such as Pommard and Volnay give grief to the vignerons year after year as do the late frosts in Champagne and Chablis. Exposure also plays an important part with Champagne producers in the colder northern region of France seeking south facing slopes for their vines, whereas in Roussillon and the Languedoc vines are often planted on slopes facing northward to avoid the sun at its peak. Now, we have added another component to our terroir diagram as you can see above. We have called this component “biota” as we are searching for a word that covers everything from the spiders, bees, drosophila, wasps, worms and ladybirds as well as the herbs, grasses and other plants found in the vineyard through to the microbes such as bacteria and fungi which play such an important part in setting up the conditions for the transfer of elements to the vine that create components of the flavours, aromas and texture of the wine. Microbes are single cell organisms that have lived (yes they are all living organisms with the possible exception of viruses) on earth for approximately 3.5 billion years. They include bacteria and fungi and we can’t make wine without them. In fact, humans cannot live without microbes. Microbial populations in the soil and on plants vary due to environmental conditions (wind, exposure to the sun, rain, water table, plants and much more) and also due to farming practices. So this is why we claim that the biota is an integral part of the terroir. Recent studies in Spain, California and Slovenia have found that yeasts which occur on grapes can be different on one side of a valley to the opposite side and that the distribution of yeasts varies with climate, soil and vine variety. And we know that if different yeasts exist on the grapes then the compounds produced during fermentation will be different leading to different aromas, different flavours and different mouth feel. Now we will briefly address how microbes assist in the transmission of essential chemical elements from the soil into the vines. There are a number of essential elements or nutrients for vine health shown in the table below derived from a number of scientific papers. Note that three of these elements can enter the plant directly from the atmosphere whereas all the others need to have the right conditions in the soil to enter the plant. Of all of these it is nitrogen that is needed the most to create plant tissue and to manufacture chlorophyll (C55H72O5N4Mg). If there is insufficient nitrogen then the leaves show signs of chlorophyll deficiency and plant growth slows down. Too much nitrogen, however, leads to excessive growth making canopy management difficult. So nitrogen in spring is good – too much nitrogen in summer can also lead to problems. But notice in the table above that the first three atoms in chlorophyll come from the air. The magnesium (Mg) and nitrogen (N) only enter the vines via the soil. Healthy soil will help develop the fungi and other microbes needed to help transport those elements into the vines. We have previously written two articles on the research that links soils to minerality displayed in wine and were able to show that elements from the soil are passed into the vine and then to the grapes and that these elements alter the sensory qualities of the wine. The quality of the soil (as opposed to the type of soil) is one of the most under-rated of all of the factors affecting the terroir which in turns influences the quality of the grapes which of course affects the quality of the wine. We were also able to cite research that indicates that soils that are treated organically or biodynamically are more effective in assisting the transmission of these elements into the vines. Vines that have not been treated with chemical insecticides, fungicides and pesticides are more likely to support thriving colonies of micorrhyzal fungi which attach themselves to the roots of the vines and assist the passage of the sixteen important elements into the vines. Without these important fungi this element transfer does not occur. And it is not only the fungi that are destroyed, it is also the yeasts. In an interesting study by Cordero-Bueso and others in Spain, robust commercial yeasts were distributed through a vineyard and then the grapes, leaves, bark and soil were sampled over a three year period. The yeasts survived for the first 8 months, however as spraying of pesticides was carried out, the yeasts started to disappear and none were present after 2 years whereas they did survive in an area that was free of sprays. It is therefore reasonable to assume from this research that spraying also kills native yeasts and therefore a key element of the natural terroir. Not enough attention is given to the microbial content of the soil. Without thriving microbial colonies the soil lacks the nutrients to pass on to the vines and hence to the grapes. Too little study has been carried out on the variations in fungal and microbial colonies on grape berries and how these vary geographically. It has long been held that regional differences (eg between Gevrey-Chambertin and Chambolle-Musigny) were solely due to variations in soil and exposure. regional, site-specific, and grape variety factors shape the fungal and bacterial consortia inhabiting wine-grape surfaces. these microbial assemblages are correlated to specific climatic features, suggesting a link between vineyard environmental conditions and microbial inhabitation patterns. Taken together, these factors shape the unique microbial inputs to regional wine fermentations, posing the existence of nonrandom “microbial terroir” as a determining factor in regional variation among wine grapes. This clearly shows that fungi and microbial colonies do play a part in terroir and that the modern exercise of dousing the grapes in sulphur as soon as they are picked and then adding laboratory yeasts for the fermentation removes one of the key elements of terroir from the equation. We have written before about the role of wasps, bees and drosophila in spreading yeasts in vineyards, and this has now been backed by a scientific paper published in the Proceedings of the Academy of Sciences which showed that wasps and other insects are vital in spreading fermentation yeasts onto grapes in the vineyard. Similar results have been reported for stone fruits as well. As discussed earlier it has been clearly established that the use of pesticides, herbicides and fungicides reduce the beneficial microbial populations on vines and in the soil as a general rule. And we refer back to the work of Cordero-Bueso who found a direct link between the application of pesticides in the vineyard and the damage to microbial populations. It seems clear therefore, that to fully express a local terroir, vineyards need to be free of harmful pesticides and herbicides and wines should be naturally fermented with the yeasts that are part of the vineyard’s terroir. Biota is defined as the animal and plant life of a particular region, habitat, or geological period. Cordero-Bueso, G et al. (2011) Influence of the farming system and vine variety on yeast communities associated with grape berries. International Journal of Food Microbiology. Vol 145 (1): 132-9. This study looked at the influence of different agronomic parameters (terroir) on the biodiversity of fermentative grape yeasts. Bokulich, N et al. (2013) Microbial biogeography of wine grapes is conditioned by cultivar, vintage, and climate. PNAS Early Edition 1317377110. Cordero-Bueso G et al. (2011) Remanence and survival of commercial yeast in different ecological niches of the vineyard. FEMS Microbiology Ecology. Vol 77(2): 429-37. Nicholas A. Bokulich, John H. Thorngated, Paul M. Richardson, and David A. Mills. (2013) Microbial biogeography of wine grapes is conditioned by cultivar, vintage, and climate. www.pnas.org/lookup/suppl/doi:10.1073/pnas.1317377110/-/DCSupplemental. Stefanini, I., Dapporto, L., Legras, J.-L., Calabretta, A., Di Paola, M., De Filippo, C., Viola, R.,et al. 2012. Role of social wasps in Saccharomyces cerevisiae ecology and evolution. Proceedings of the National Academy of Sciences 109(33), 13398–403.